TL;DR: Know what you're talking about. Have speaking experience. Respect other technologies. Submit many proposals, both original and common. Don't submit too narrow topics. Proof-read your stuff. Tell attendees why the talk is useful. We do our best to balance our content. We expect speakers with knowledge, experience and attitude fit for a multi-technology conference. We also select a significant portion of speakers that haven't spoken at our event before. We strive to bring the most useful content to our attendees. It is important to be familiar with the topic proposed and have real world experience with it. You really have to know what you're talking about. ConFoo is a non for profit organisation. Each speaker incurs many costs to us, and so we can only accept one speaker for any given presentation. Needless to say that we want speakers that can speak the language reasonably well. We prefer speakers to have some kind of lecturing experience. We expect you to have at least practiced at a local level, such a user group. Please add a link to some slides in the comments. We need to thoroughly research our speakers, so help us out. ConFoo's core values include collaboration between technologies. It is important that our speakers respect competing technologies. Also, speakers should focus on teaching solutions and avoid a "bashing" attitude. Submit multiple topics even if you have competition. A relevant presentation never gets too old. Try to pick somewhat broad topics. Last year, we picked about one in three proposals. Creating a balanced content mix is very hard, and so we recommend that you submit more than one proposal. Also, try to submit topics that are not too similar. If you require transportation and/or accommodation, we will most likely expect you to present two subjects, so give us enough proposals to work with. There are always new developers that have never heard of something basic, so it makes sense to repeat some topics, even if it has been said in the last 10 years. You would want the next generation to know these things, right? Say a world-renowned speaker submitted the same topic that you had in mind. Perhaps some constraints will prevent us from picking this speaker. Try anyway. Also remember: we like old friends, but we also enjoy seeing new faces. 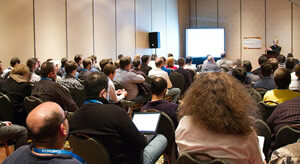 Since ConFoo attendees have to miss five presentations to see yours, it is a good idea to avoid being too narrow. For example, if you present about a framework in a specific programming language, don't focus on only one component of that framework. Such presentations usually get no attendance. Attendees also enjoy a few tech-independent presentations in their schedule. Find a good balance between originality and function. The title must be meaningful and represent well the main topic covered. It's good to be original, but attendees come to the conference to learn, and they would rather not guess what the presentation is all about. Also, try to keep it fairly short. Clearly state topic, aspects covered and presentation's value to attendees. You will write a summary (450 characters, about 6 sentences). Please do not use bullet-points in the short summary as it will be used in print materials where space is very limited. Make sure that attendees understand from your summary what is it you will talk about. Teasers do not work well at such conferences. Attendees would also like to know what angle or aspects of the topic you will cover. This is also helpful for us to gauge overlap with similar proposals. Attendees need to get value from the presentation. They don't come to hear people speak, but to learn from their experience and apply that knowledge in their work. Make sure to state what value they will get. Also, attendees pay attention to grammar and so do we. Please proof-read your proposals before submitting.